At its February meeting Oregon PERS tentatively decided to invest $100 million in a partnership designed to purchase failed banks. While the Oregonian reporter Ted Sickinger wrote an excellent detailed article, the Bloomberg article, written by Dakin Campbell, looks as if it were written by the partnership and includes major inaccuracies, presenting a business media related risk to all investors considering investing in troubled banks. This risk, business media risk, is rarely discussed yet it is important to recognize. Turning around the banking industry is imperative to restarting the economy and initiating the next business cycle. For this reason my research has focused heavily on this proposed investment. 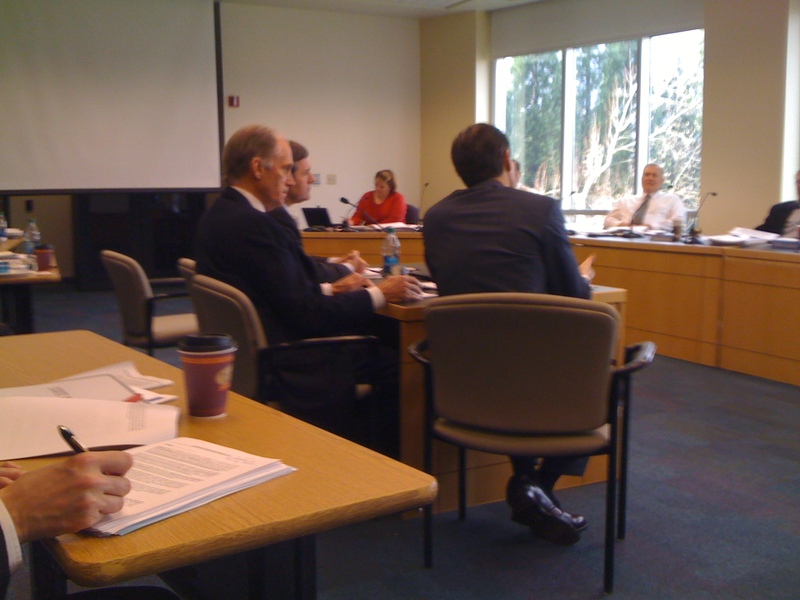 Pictured above, center, giving his presentation to the Oregon Investment Council is former JP Morgan CEO William Harrision. While Sickinger’s article highlighted Harrision’s role, the Bloomberg “exclusive” made no mention. In preparation for this meeting, I provided the same information to the Oregonian and Bloomberg reporters, although in Bloomberg’s case it was provided to the local Oregon based Bloomberg reporter Anthony Effinger. Also provided to Effinger prior to this “Bloomberg Exclusive” article containing major inaccuracies was a letter to State Attorney General John Kroger (letter included at end of post) noting that the partnership’s structure was not legal given that it was done on “tax efficiency” grounds. Simply put, this would be like me being in a partnership with the City of Portland and trading the City’s depreciation deductions on City Hall for a slightly higher equity position. Although creative, this is not legal since the City, even though a partner, is tax exempt and has no depreciation deductions. In addition, the presentation was made by former JP Morgan CEO William Harrison (see photo from meeting). Harrison is a controversial figure, as is his fellow partner, the former CEO of Waccovia, since it was under Harrison’s watch at JP Morgan that the explosion in toxic derivatives occurred that ultimately took down the banking industry. Harrison and his Community Bancorp partnership were presented by Sageview as being independent of Sageview, yet they are not. This proposed investment is a significant event for the banking industry in that Oregon PERS is ligitimizing funding a partnership created by two of the current debacles key architects. This makes no sense when Oregon PERS could go out and find much better partners with better terms. Especially given that the proposed structure provided a triple public subsidy in the form of 90 percent FDIC backing on the loans, 90 percent funding from public pensions and ultimately large stock option gains they will be able to take a full deduction on, even though only a small portion will be recognized as an expense given the expense is calculated on the date of grant while the deduction is based upon the date of exercise. Excessive stock options are indeed the most abused executive perk and should be closely monitored by all investors in that in this case they are a license to fleece other investors, in this case Oregon PERS. is legal on two specific grounds. focus will be to takeover community banks, not large banks. percent of the holding company they eventually plan to take public. include Mark Shapiro and various others he has collaborated with in the past. important institution before the taxpayers, PERS. efficiency” purposes related to the partnership structure. subject of the comment. This is simply ridiculous.